For marketers, almost nothing is as valuable as hearing the unvarnished, unfiltered point-of-view of buyers. At last week’s Massachusetts Tech Leadership Council’s “Cloud Seminar: Choosing the Right Cloud for Your Business,” marketers would have had a lot to listen to. Speaking to a sophisticated, engineer-centric audience with over 20 years’ experience in development and operations, GitHub’s Mark Imbriaco didn’t pull any punches in presenting his perspective on the myths and realities of the benefits of the cloud. Means of avoiding IT bottlenecks? Myth. Driver of increased agility and speed to market? Definite reality. From a value proposition perspective, the implications are clear: be wary of emphasizing cost and operational advantages of your cloud solution because they’ll like meet with skepticism. A panel discussion featuring engineering executives from Carbonite, Ipswitch, Acquia, and Scribe built on Mr. Imbriaco’s perspective. In responding to questions about their infrastructure evolution, they said that decisions about when and how to deploy IaaS, PaaS, and S(torage)aaS would always be based on the strategic business needs for a given initiative or project: when time-to-market is critical or in which utilization is highly unpredictable, cloud is attractive; in a scenario with consistent demands and a need to control variable costs, cloud is a poor choice. Since EMI’s founding over 20 years ago, a core focus has been what we call “marketing for sales.” One of the key propositions of this focus is to bring marketing principles, strategy, and messaging to the point of sale. And it’s obvious that many companies struggle with this, as we often encounter samples of sales campaigns that demonstrate a lack of marketing expertise. One such example is below. Having a single, prominent call-to-action. In fact, the only call-to-action in the message is to respond to the email and write a message stating which session is preferable. Facilitating response by offering multiple response channels and making it easy to take the desired action. There is no opportunity to click on a link to respond, no number to call to register, no button taking you to a form on which you could register. Any or all of these additions would have increased response by making it easier and more straightforward. Offering a compelling and prominent headline that draws the recipient in. What is the headline of the email? Is it the small message at the top saying this is the last chance to register? If so, only the more patient readers would find that sentence because it is overwhelmed by the logo immediately below it. Based on the content and the fact that typically this company is a very effective email marketer, it seems likely that the email was sent not as a marketing campaign, but rather by the sales team. This ineffective email is precisely why “marketing for sales” is so important and represents such a powerful opportunity for many companies. 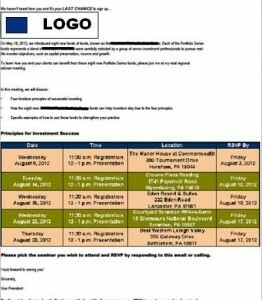 Imagine how many more prospects would have registered and attended these events if the email had offered large buttons for each event which, when clicked, would have registered the clicker and taken them to a confirmation page that offered them a “save to Outlook” option. Consider how much more compelling it would have been to have a name in the closing, rather than just “Vice President”. Injecting marketing expertise into sales channel activity means more registrations, which means more attendees, and that means more sales. View your CRM approach and communications through the lens of the customer. Understand that satisfaction = reality – expectations: if you set expectations properly through communications, then satisfaction will benefit. This summer, for the first time, my 11-year-old daughter decided that she really wanted to go with a friend to overnight camp. The camp we selected was one that the friend—and my wife—had attended in the past and enjoyed a great deal. For anyone familiar with overnight camps these days, it will not come as surprise to learn that the cost for a month of camp was not insignificant. My wife and I wanted our daughter to be able to have the experience, though, so decided to sign her up. About a month before camp was to start, we received a communication that detailed all of the clothes that our daughter would need during her stay. All of a sudden, we were now on the hook for several hundred dollars more, but we appreciated the level of organization that enabled us to ensure that our daughter had what she needed. We were informed that in addition to the clothes on the list, we would also HAVE TO purchase several shirts and pants from the camp. No option to opt-out, no mention of that when we signed her up. Then, immediately after dropping her off, we were told that in order to communicate with her we had to sign up for an emailing service for which, yes, there was a fee. Now, with the end of camp approaching, we have received another communication: on the day we pick up our daughter we must—before we actually get to see her—settle up her “Canteen tab”, which comprises items (e.g., batteries, candy, soft drinks) she “purchased” from the little on-site store as well as the costs associated with day trips (e.g., to a nearby amusement park) planned by the camp. All these additional costs took us by surprise. Maybe they were buried somewhere in the material provided about the camp, but they certainly weren’t prominently displayed. Moreover, we had no control over the expenditures. I’m confident that opting-out of the amusement park trip was not an option, nor would I have wanted to deprive my daughter of the experience, but since the camp knew it was going to charge me for these things, why didn’t it clearly tell me upfront…or better yet, why not build the charges into the cost of the camp? 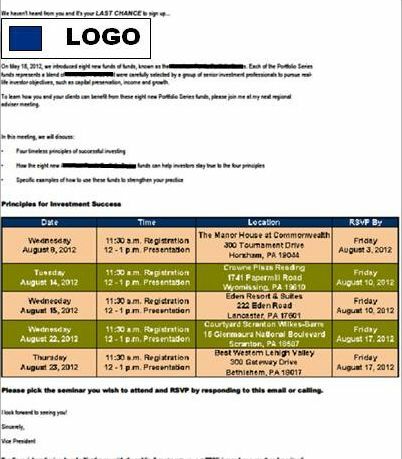 That’s called negative word-of-mouth and it should be a cause of concern for any business—but especially ones like this camp that relies on referrals for most of its marketing. Now, not only am I on the fence about sending my daughter, but I’m sure the parents I talk to will have second thoughts about sending their children. Avoiding this problem wouldn’t have involved any loss of profit for the camp; all it needed to do was follow the rules laid out at the top of this post.